Great review, moralfibre & GTO. It was certainly worth the wait! I was particularly interested in knowing how the AT variant fares in real life situations. Just like many others, I wish that the AT was offered with more safety options. 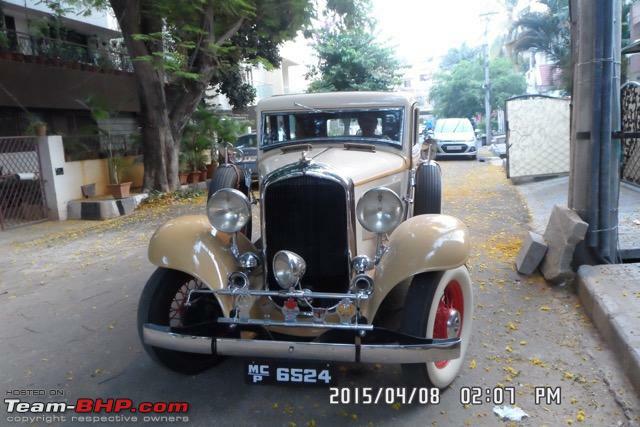 AT owners can go for the aftermarket leather seats and alloys. However ESP and 6 balloons would have been very comforting. Given the lack of options for AT in this price range, I am leaning towards Creta. Had been waiting of this review since quite a while, finally the wait is over. Very interesting write up with deep analysis of each and every aspect of the vehicle. Was absolutely flummoxed to read about the ergonomic blunders committed by the company (manually operated ORVMs amongst one of them). Nonetheless the overall package is quite decent. 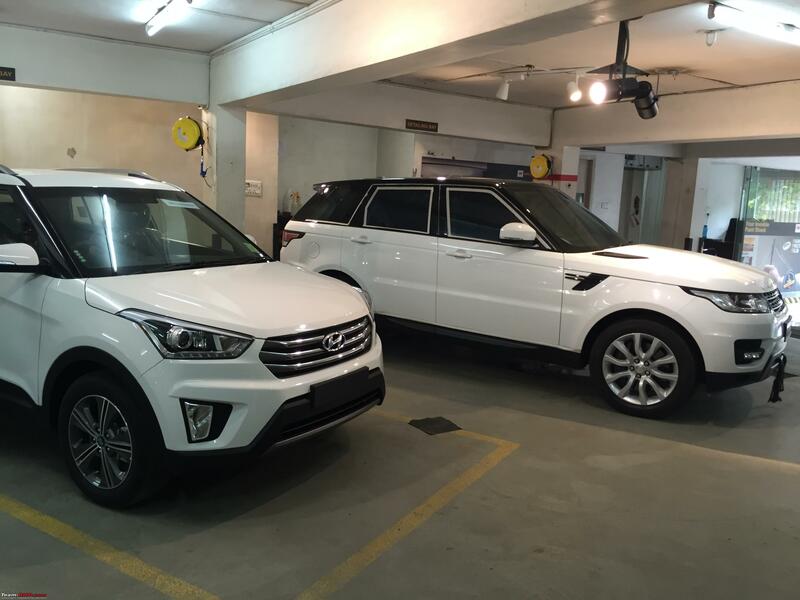 Were those pictures clicked at the 3M Detailing Centre in Santhome (Chennai) by any chance? Was absolutely flummoxed to read about the ergonomic blunders committed by the company (manually operated ORVMs amongst one of them). Ergonomic blunders? Manually operated ORVMs? Last edited by RSR : 24th August 2015 at 22:02. Thanks for pointing towards wrong choice of words owing to overzealousness while posting. Regarding the manually operated ORVMs, was actually pointing towards their operation, that in the much cheaper i20, they auto-fold in & out as you lock & unlock the car but not in Creta. Similarly chrome door handles have the request sensor on the driver side only, whereas in an i10 Grand this very feature is available on both the doors. 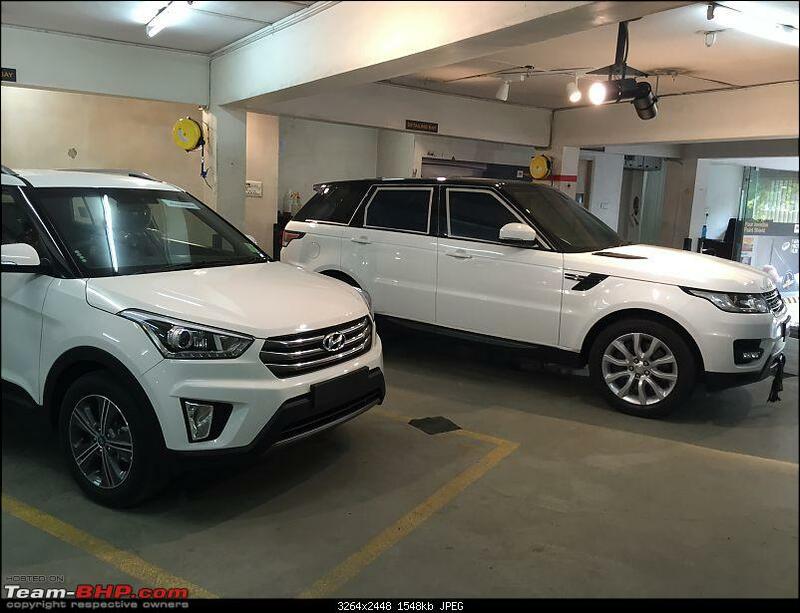 With Creta being a premium SUV, these omissions don't augur well. 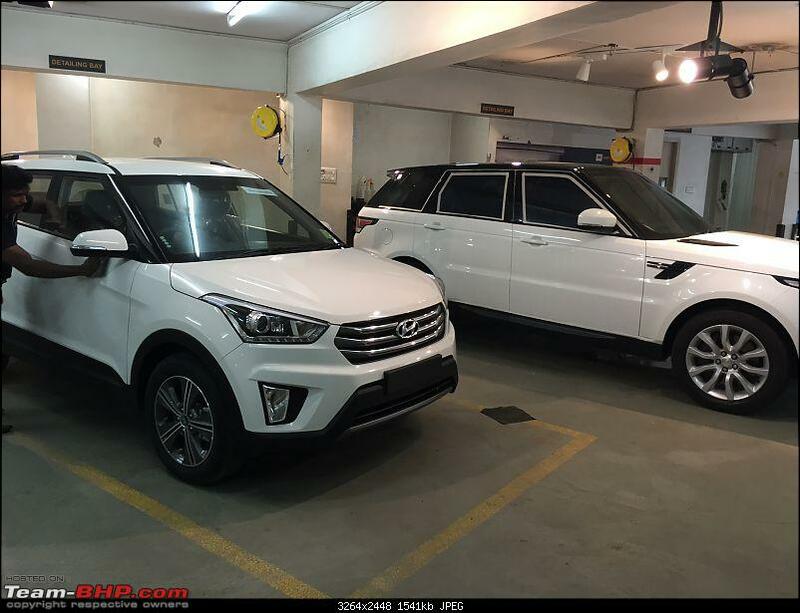 The Creta AT SX(O) at 18-19 lacs, yes. Beyond that, maybe not. XUV W8 AT at up to 21 lacs, yes. Not so sure if I'd pay more for the W10 or AWD. Heard from some sources that Hyundai has dropped the Keyless entry and go with start/stop button feature from the Grand i10. Are they trying to justify their new pricing strategy? Excellent review. Point I like about it is that earlier detailed information that came in Team BHP is actually through owners or prospective buyers, who are all excited about the vehicle and at times I feel them a little biased. This is a very neutral and perfectly balanced write-up. This review should have come out first. Chrome door handles with a 'request sensor' on the driver's side only. 6 lakh rupee Grand i10 gets them on both doors. An endless blunder of features allocation, seriously! I don't think this is really a miss from a practical point of view. My experience in Xcent is, the request sensor that you intend to press needs the key close enough to that particular sensor. So when my better half or mother reaches out and press the button on the co-driver side, it actually doesn't open. Because the key is in my pocket, and I would have moved to the driver side. So practically I have to centrally open the door from the request sensor on driver side door, even if I had decided to get in a little later than the person on the other side. However auto-folding mirrors on locking the door, that was an absolutely cool feature. It should have been there. I don't know what was saved in this shortcut by Hyundai. I think it's just the firmware program, and maybe rectified in future. There is a practical use of having a sensor on the passenger side. While your point is valid in case there is a passenger, many times I am traveling alone and have some bags/luggage on the passenger seat. After getting out of my Xcent, I go over to the passenger side for easy access to take out the luggage and then press the sensor on the passenger side to lock it without taking out the key or needing to go to the drivers side. This will not be possible with the Creta. I actually think that the reverse sensor on the passenger door though not a big miss, is actually quite useful . In fact my Elantra and I10 grand auto has it on both the doors. I normally use this to access the glove if standing outside the car. It's a pain to get in from the drivers side and bend over to access the glove. Not that we cannot out use the key fob to unlock remotely. Once you get used to a few things you just don't use your brain.Eg my cook. I asked her to heat some food for me and she came back saying there is no power for the microwave. Use the gas stove was my response. Stupid. No auto folding mirrors on locking the car is ok to live with. Especially if you have a very tight parking space. You don't want it to open is a tight space. I normally don't fold my mirrors at all. I rather someone scrapes past the mirror than the body work. I guess the argument here is more about paying big money and not getting features that a present in cars that are 2 segments below. Hyundai is now seriously removing equipment on their base cars. The I10 sports variant used to have a lot of features and even the start/stop. It was removed when I bought mine. Recently hear that they a removing this function even on the Asta model. With the free falling rupee, let's get ready for less equipment for more money. So finally. What's the take on the wading capability of the Creata? Will it come a cropper on flooded roads? There seems to be two sides to the same argument. Last edited by Arjun Reddy : 25th August 2015 at 09:29. True it isn't that big of a deal, but I still like it because that way the key gives me access to both sides of the car and the boot. If I left something in the car, I just open whichever side is easier to access and is facing me or if I'm letting a friend drive, it means I can still keep the keys in my pocket. When cars used to come with key holes on both the driver and the passenger side, why shouldn't there be request sensors on both sides for keyless entry too? The convoluted intake air mechanism is same in all Hyundai Diesel cars.Our 5 year old i20 has the same plumbing layout. Basically since all of them use similar diesel engines(1.4L and 1.6L CRDI and the erstwhile 1.5L do not have much in difference structurally) they must have arrived at this 'convoluted' design after some thorough R&D. And the way these two engines pull and the refinement says that the design indeed works! Also since the design has remained the same for nearly a decade proves that its a tried and tested design. Why fix something if it ain't broke? 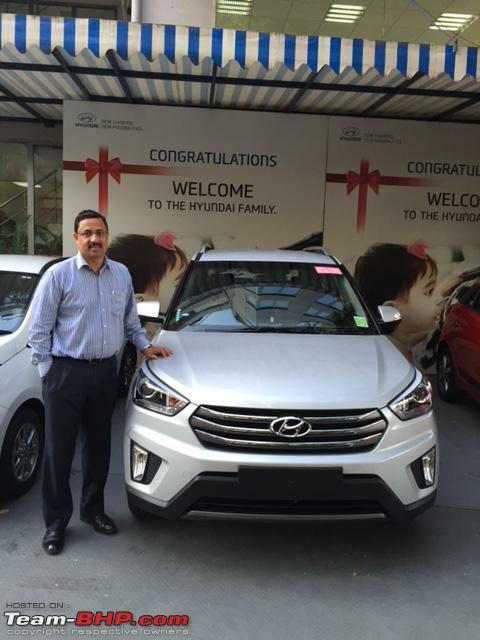 My journey with Hyundai started on 09/09/99 when I took delivery of my Santro DX from Trident Hyundai. The Santro DX was choosen because many segment first's that it had (we already owned a Zen), namely power steering, power windows, fog lights, tinted glass, rear wiper, rear defogger. In 2003, I purchased the Accent CRDi. My favourite car till date, as this introduced me to the CRDi technology and pleasures of driving diesel. What a fun car to drive. 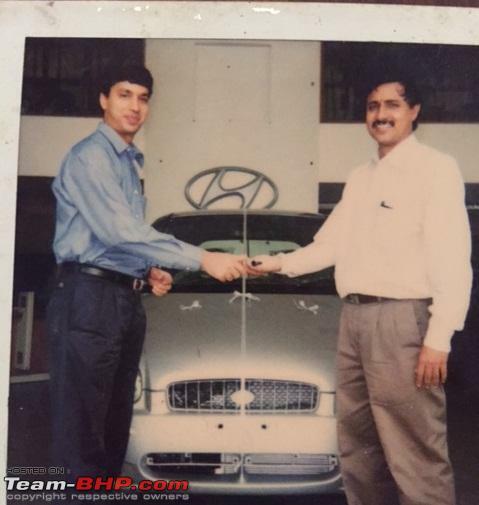 In 2009 the 1.1L Santro AT made way for the 1.2L i10 AT. The i10 was far superior to the Santro in terms of ride quality. In 2009, I sold the Accent CRDi after running it for 85K kms without any engine or clutch work and bought a i20 CRDi Asta (O). The i20 introduced me to pleasures of highway driving and superior breaking (4 discs with ABS & EBD). Did some great long drives in this car. In 2011, the i20 was sold and I moved back to the sedan class with the Verna Fluidic SX CRDi. Great refinement and enjoyed the engine and gearbox. Suspension was too soft. Upgrade to harder Continental CP2 tyres did help a lot. In 2014 the i10 AT made way for i10 Grand CRDi Asta (O). I would have prefered an AT, but my Dad's who primarily drives this car wanted this. 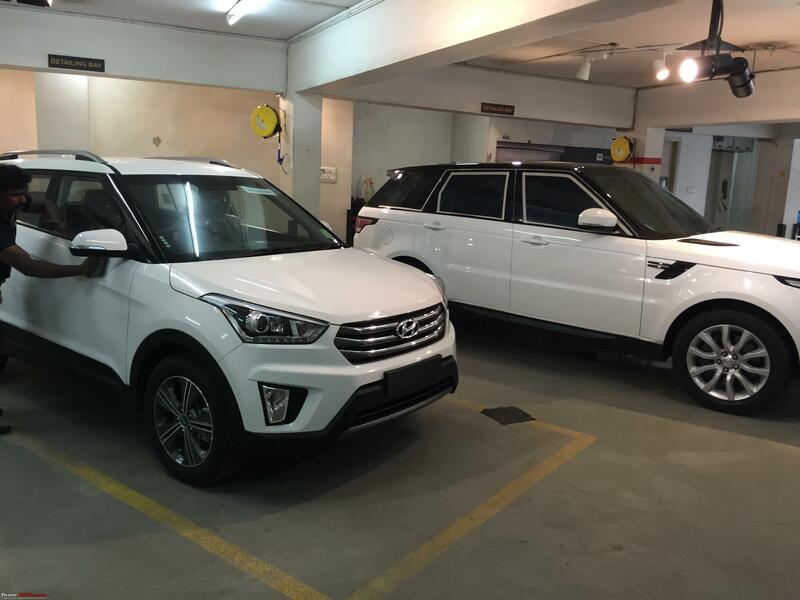 Now in 2015 the Verna gives way to the Creta CRDI SX (O). Looking forward to enjoy this car. The Verna was a good car and I believe that the Creta is good upgrade in terms of driving, safety features and suspension. All times are GMT +5.5. The time now is 10:13.